Tre Mercati Lollipop > Thermostatic Twin Shower Valve With Head & Arm. Lollipop thermostatic twin concealed shower valve in chrome with round shower head and wall mounting arm. Round shower head included (180mm). Suitable for combination boilers, gravity fed systems and mains water systems. Suitable for low pressure water systems. 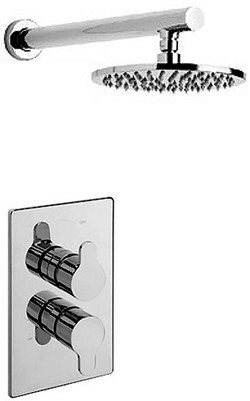 10 Year guarantee: Tre Mercati guarantee this Lollipop shower set for 10 years. Tre Mercati's Lollipop range of taps and showers are manufactured from high quality solid brass and have easy to use curved lever handles.